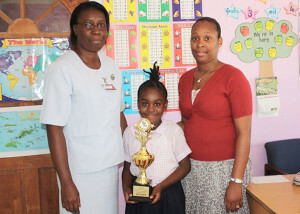 (L-R) Nurse Watson, First Place Poster Competition Winner Angeleah Cupid and Teacher Jacobs. Friday, May 9 – The British Virgin Islands Health Services Authority (BVIHSA) announces the winners of the Vaccination Week Essay and Poster Competition. This year’s slogan “Vaccination: Your Best Shot”, was observed with a poster competition for primary school students, an essay competition for secondary school students, health education sessions on Hepatitis B Vaccine, radio appearances, community out-reach vaccination sessions and patient vaccination updates. Awarded first place in the poster competition was Angeleah Cupid of the Little Rainbow Primary School and second place was awarded to Jordon Potter of St. George’s Primary School. Awarded first place for the essay competition was Solene Seaman of the St. Georges Secondary School and second place was awarded to Desnique Collins of the Bregado Flax Educational Centre Secondary Division. The Manager for the Expanded Programme of Immunization Mrs. Marina Bedeau expressed her appreciation with the schools involvement and encouraged more schools to participate next year as these activities motivate students to learn more about vaccines. The trophies and prizes were sponsored by Scotia Bank, Digicel, One Mart Superstore, Speedy’s, Kids Kornor, and the National Educational Services. The BVIHSA wishes to express appreciation for all donations. The 12 Annual Vaccination Week was observed from 26th April to 3rd May, 2014. Vaccination Week is observed to raise population awareness regarding the importance of vaccinations in protecting communities from vaccine-preventable diseases and to celebrate the achievements of immunization programs.